But that $2,000 price is hard to swallow. I use two cameras on a regular basis: my iPhone 7 Plus and an Olympus OM-D E-M1 Mark I. The latter has been my workhorse since 2014, when many Engadget staffers started using it for field assignments. I've taken it to almost every press event I've attended these past two years, and the results are rarely disappointing. Still, the idea of a faster model with a better autofocus was tempting. 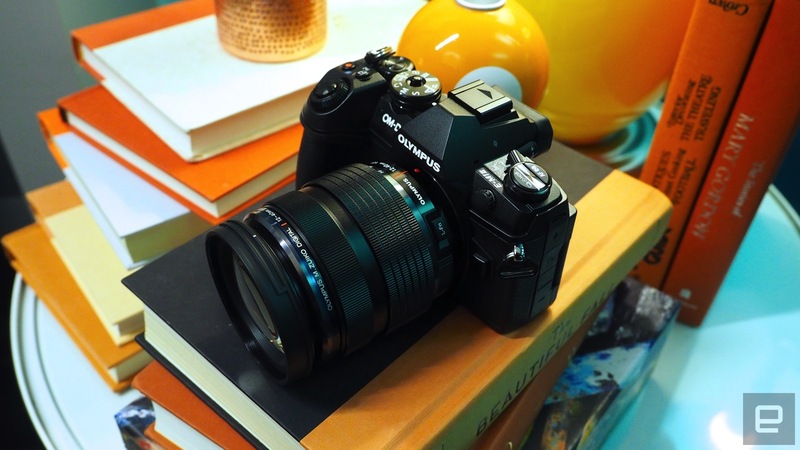 That's where the recently launched OM-D E-M1 Mark II comes in. 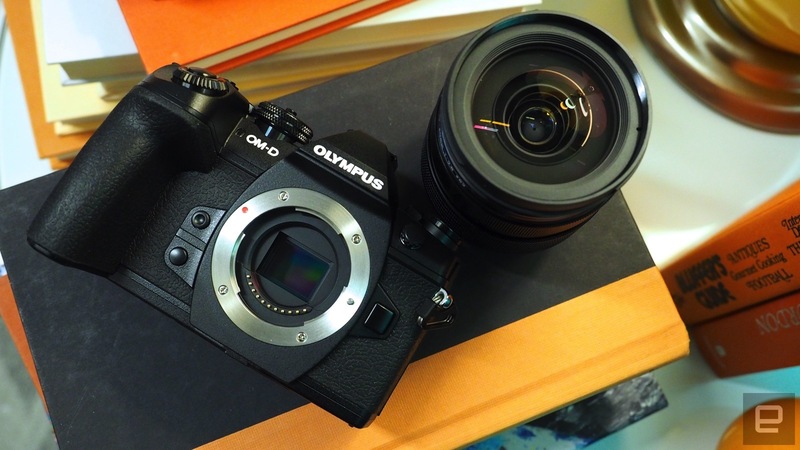 OIympus' latest flagship mirrorless, available in December for $2,000 body-only, is pegged as a major upgrade to its predecessor. It features a new 20.4 Live MOS Micro Four Third sensor, a powerful dual quad-core TruePic VIII processor, in-camera image stabilization and a 121-point autofocusing system. You can also record 4K video in Ultra HD (3,840 x 2,160) and Cinema 4K (4,096 x 2,160) at 24, 25 and 30 frames per second. There's also an option for 18-fps continuous shooting with autofocus and autoexposure enabled. If you lock those settings, the camera can handle a ridiculous 60 frames per second. The E-M1 Mark II's specs make the Mark I seem more dated than it actually is. That may have something to do with the second-gen shooter being way more expensive at launch; by comparison, the original cost $1,400. Naturally, there are some similarities between the two, like WiFi capabilities and a compact weatherproof body. The ergonomics haven't changed much, so I didn't have any trouble getting used to the physical dials, finding buttons or gripping the camera. That said, the first thing I noticed was how much heavier the Mark II feels than its predecessor. 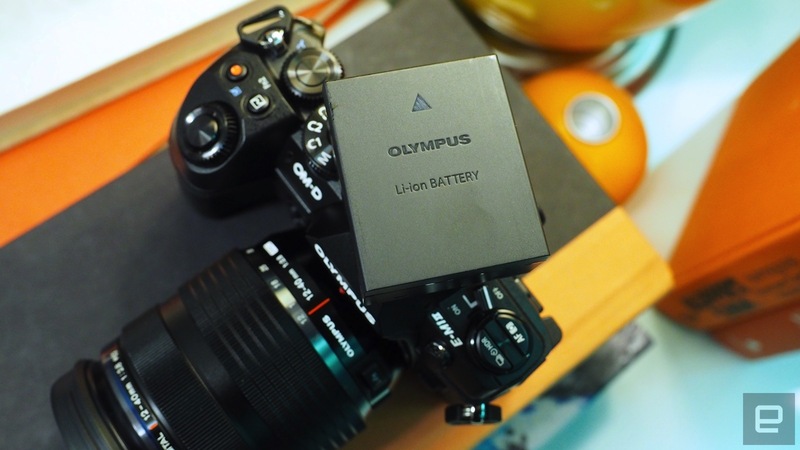 That's largely due to the bulky 1,720mAh battery, which Olympus claims lasts 440 shots per charge. Of course, you'll get fewer shots out of it if you take videos along the way, but I haven't had to charge the camera as often as I did the Mark I. Seriously, though, I'm not kidding when I say this battery is bulky -- I can't recall seeing one like it in any other mirrorless camera I've tested. Just look at it. The one thing I'm not a big fan of is the new 3-inch articulating LCD, namely because the only way to tilt the screen toward you is by sticking it out to the side of the camera. More often than not, this made it hard to ensure my subjects were centered. 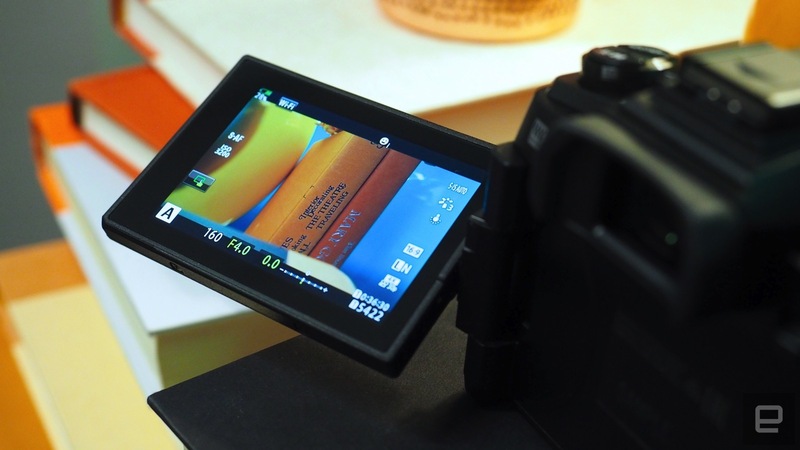 Although I rely on the high-res 2.36-million-dot electronic viewfinder for most of my shots, the display becomes essential when you're recording videos or using the touchscreen to browse menus and tweak your settings. Aside from that, I love the E-M1 Mark II's design, but that's easy for me to say since I'm familiar with the previous version. As you'd expect based on its spec sheet, the E-M1 Mark II produces beautiful images. It didn't matter how, where, when or who I was shooting -- the camera always delivered at least one solid shot. Olympus says its new flagship is designed to make it easy for anyone, not just professionals, to capture great photos of moving subjects. Thankfully, since that's not one of my strong suits, the E-M1 Mark II worked as advertised. In particular, I was glad I had the 60-fps continuous shooting mode (with locked autofocus and autoexposure) at my disposal whenever needed. Whether I shot acrobats performing corde lisse (read: dancing on a vertical rope) or cars on the streets of New York, the camera didn't have any problem keeping up. But having a fast camera is only part of the equation. The new sensor, lag-free electronic shutter, improved AF and in-camera image stabilization are what allow the E-M1 Mark II to shine in different scenarios. I was incredibly surprised by how well the shooter handled low-light scenarios, with most of the images I took in the dark looking vibrant and showing little to no signs of noise. There's an ISO range of 200-25,600, with automatic noise-reduction kicking in at slow shutter speeds. For reference, my review unit came paired with an M.Zuiko ED 12-40mm f/2.8 lens, which costs $1,000 on its own. Despite some of the minor quirks I mentioned, the E-M1 Mark II is undoubtedly Olympus' best mirrorless camera to date. But here's the thing: I think the E-M1 Mark II's main flaw, if you can call it that, is that it costs $2,000. That's a lot more than competing cameras like the upcoming Sony A6500, which costs $500 less and arguably offers a better lens ecosystem. Sure, we haven't put that one through its paces yet, but Sony's track record in the mirrorless space speaks for itself. I'm not saying the E-M1 Mark II isn't worth it, but I have a hunch a lot of people will struggle to come to terms with that price. Especially if they can get similar results elsewhere. Still, if you can afford it and are are due for an upgrade, the E-M1 Mark II is a no-brainer. To view my sample images at full resolution, click here.